Hello and welcome to this week’s episode of Ukraine Calling. I’m Oksana Smerechuk for Hromadske Radio in Kyiv and we’re bringing you our feature interview followed by some new music from Ukraine. And in our interview, Bohdan Nahaylo speaks with Kyiv-based political scientist and journalist Olivier Vedrine, who hosts a TV program called The Western Voice with Olivier Vedrine. They explore French and European perceptions of Ukraine and Russia, Ukraine’s place in Europe, and the significance of Kyiv for the Russian opposition. Have a listen! Nahaylo: I am delighted to have as my guest this week Olivier Védrine. He is now known in Ukraine as a journalist who has his own TV program here dealing with current affairs, in particular what’s happening in Europe, in this region and Ukraine. Though by background he is a scholar, a journalist, he wears many hats, as I see from his biography. He will tell us a little bit more about himself in due course. So bienvenue, Olivier! Vedrine: I am very happy to be here in this nice studio and I am ready to answer all your questions and to have 25 minutes of nice time. Nahaylo: It’s not an interrogation, and it’s not a formal interview. Our listeners know we have free, wide-ranging, discussions. I will start by asking you how you ended up in Kyiv? What brought you here? Védrine: The first time I came to Ukraine was in 1994 as a student. I was in Kyiv, Lviv, Donetsk and Horlivka (Gorlovka). You may know that in those times there was a French Institute in Horlivka. Nahaylo: Horlivka in the Donbas? Védrine: Yes. It was before the war. They invited me to give some lectures in French. I was a young student. That was very interesting because I spent one month in Ukraine, and two or three weeks in Horlivka. Then I came back in 2012. I was invited by one of my cousins, Dmytro Vydrin, a political scientist, who also invited me to give a lecture about Ukraine’s place between Russia and the European Union. After that I had a project to open a business school at a university here in Ukraine. I returned to make it happen. But during that year I had to face many problems with corruption. It really broke my business school project. When the Maidan happened, I joined it and was very active there. Nahaylo: Tell me, in 2012, in your lecture did you foresee Ukraine coming as close as it is now to the EU through the Association Treaty, with aspirations to become a full member maybe, eventually down the road? Or did you see it as somehow stuck in between forever? Védrine: In that time my opinion was that Ukraine is a bridge, but one which is close to the European Union. Why? Because of the typical political French view. General De Gaulle had said “Europe from the Atlantic to the Urals”. For me Ukraine was the first step to build continental Europe based on EU norms and values. Nahaylo: So we’re hopeful that this would bring the same sort of opportunities regarding democratization to Russia as well? Védrine: Yes. When I was on Maidan, I was expecting that we will carry it on to Moscow. I thought it was only first step of this wave of democratization of European values, dut we were stopped. In my view Ukraine was, and still is, the first step. Nahaylo: Maybe I disagree here, because if Ukraine is European – it’s Eastern European at the moment – then the first steps were the Czechs, the Poles, because they broke out of a system that held them in a divided Europe for decades. Probably they made the first move. Nahaylo: We are the second step probably. Védrine: In my mind, I was thinking about post-Soviet countries. Nahaylo: So you were on Maidan. Just briefly, what were your impressions? Was it a Ukraine that you recognized, or was it something new and unexpected that was happening? Védrine: It was a revival of Ukraine. Nahaylo: But we have already seen the Orange Revolution. Védrine: For me Maidan was really the reaction of people, of a nation that definitely wanted to go to the EU. It was very obvious for me that what happened on Maidan was, is, the beginning also [of something new] for the EU – a big symbol of European values. I think Maidan is important not only for Ukraine, and when I speak with friends in Western Europe they agree that for them Maidan is also very important for the EU. Védrine: Yes, I know the story. Nahaylo: You know the story of her becoming the Queen of France. And then I think of Voltaire, who as far back as 1731, wrote, “L’Ukraine a toujours aspire a etre libre..,” (Ukraine has always aspired to be free). But somehow, because time was suspended by political interventions, it is only now that Ukrainians are returning to Europe, not in 1918, or 1919. Védrine: Yes, that’s a good analysis. Ukraine is, was, and will be a nation. Ukraine was a nation, as a nation it wanted to be independent and free, as Voltaire said. And now this nation has to build its own state, and that is really a huge challenge. Because they were a nation under other states, imperial states. Now they have to build their identity as a state. And that’s the problem, because every Ukrainian knows that they belong to a nation, but they have to understand that also they are a member of a state, with common interests, and a common good. And that’s really now the big step in “Ukraine Construction”. Nahaylo: Because Maidan precipitated the thinking, the review amonst Ukrainians, that they are a Ukrainian nation. That they live together on the same territory with other ethnicities, and that together they make up a political nation that is building that state, which is a common state. Védrine Yes. Why are they unified? You mentioned the various ethnic identities. Nahaylo: I’m talking about Russians, Jews, Hungarians, Bulgarians, Crimean Tatars, and others. Védrine: Yes, but all those people wanted and want to be free. And that’s the difference. Many times people say, “what is the difference between Ukraine and Russia?” And I say the difference is very clear for me. The Ukrainians want to be free. They like freedom. This is in their genetic make-up. Védrine: Yes. They want to be free. And, in the Russian psychology, they want to be large, great, an empire. Nahaylo: And under a tsar, a firm hand, I suppose. Is that because of the communalistic mentality, because of hard winters, having to pull together to survive? As opposed to Ukraine’s almost anarchic individualism – the Cossacks, the steppe, free farmers. Védrine: I think that the identity of Ukraine is based on the heart of the Cossack. This is the Sich [Cossack stronghold on the Dnipro], this is the democratic constitution of Pylyp Orlyk [Cossack Hetman, or leader], this is the story of Ukraine, really. Nahaylo: Pylyp Orlyk’s son ended up as a General in the French Army. Védrine: Pylyp Orlyk created the first European Constitution. And this Constitution was based on the Cossack tradition, because, you know, the Cossacks elected their Hetman. Nahaylo: Temprarily, not for life. Védrine: Yes, not for life. And that’s a big difference. I repeat, the Ukrainians want to be free, and in Russia they want to be great, big, an empire. That’s really the difference. In Russia this difference will decrease, because now they also want to be free and to live as in the West. But Putin is trying to revive the old psychology of empire. And that’s a mistake, for the long term. Nahaylo: Still, it seems, the majority of Russians voted for him. Nahaylo: Even if the figures were manipulated, there was a substantially large amount of support for him. Védrine: We can speak a lot about Russian policy. As you know, I support the Russian opposition in exile 100%. And, in my opinion, the Russians voted with the mentality of the Soviet times. That means they voted because they had to vote. They don’t care. They say, OK, Putin is the candidate, we’ll vote for Putin. But this will change nothing. And they say, we want to survive, Putin is here. They don’t have a sense of politics. Nahaylo: Therefore, As the French would say, ‘plus ça change, plus c’est la même chose (“the more it changes, the more it’s the same thing”)? But tell me, what is the current perception of things in France? I know this is asking you to simplify greatly. Are people in France interested in what’s happening in Ukraine? Are they aware that the war is continuing? Do they feel that Ukraine needs support? Védrine: OK, that’s a very good question because in France the Russian propaganda is very efficient. You know that we have Russia Today, we have Sputnik, and all that. And during the presidential campaign last year, the current president, Emmanuel Macron, had to face fake news and manipulation during the campaign against him. Nahaylo: And he reminded Putin of this face-to-face in front of the cameras. Nahaylo: And he also reminded him that Princess Anne was not a Russian princess, but from Kyiv. Védrine: Yes, only. And that’s a pity, really. Nahaylo: It is a great pity. What can be done to change this? Is it a weakness in Ukrainian foreign policy, is it a weakness of its civil society, of its cultural diplomacy? Why is Ukraine’s voice not heard more effectively? In France in particular, especially now that you have a president who effectively has become the new leader of Europe? Védrine: It is a problem of money, because you know that the investment made by Russia in propaganda is huge. And Ukraine cannot match this investment. You cannot face Russian propaganda alone. Ukraine doesn’t have the money. Nahaylo: What about business interests? Germany has its business interests with Russia, the latest and most pertinent example being Nord Stream II [project to bring natural gas to Germany via the Baltic Sea and bypass Ukraine]. But France is also interested in that project – Trump isn’t. It’ll be interesting when your president meets with Trump, or when your president meets with Merkel, what the outcome of these discussions will be? Védrine: Business is one aspect. But France, and President Emmanuel Macron will not allow Russia to do what Russia wants because of business. I’m 100%, sure of that. Macron is, and will be very strong, in facing up to Putin, as he was in Versailles. It will continue. Nahaylo: He’s probably the only political figure of his stature that I can remember that’s done that publicly. That has shown the backbone, and the courage to really show Putin his place. Védrine: But this is also the new generation, you know, because Macron is 40 years old. And this is the new generation, and the new generation is not under the influence of the post-Soviet attitude. And we have this luck because my generation, those in their 40s in France, are not under the influence of the post-Soviet era and all that. And Putin has no power over Macron. Nahaylo: Let’s move on. In two words or so, on the days of the French language here in Kyiv, which were supported not just by the French embassy, but the Belgian embassy, and which other countries? Nahaylo: Canada, yes. Are these Days of the French Language having an impact? Do they find a sufficient resonance in Ukraine? Védrine: The French Spring, and all those French events are very good, and of course I am in favour of that. I was – I am, very happy in Ukraine when I can speak French with Ukrainians. I am very surprised that a lot of Ukrainians understand and can speak a few words of French. We have to improve that. Nahaylo: We have to. I was born in Britain, of Ukrainian origin, but at school, at grammar school, French was a compulsory subject. So merci l’école Brittanique pour ça. But, unfortunately, here I don’t think French was a popular subject that was taught in the Soviet period. I think, ironically, German was taught more often than French for some reason. Védrine: Yes, but I am surprised that I meet a lot of Ukrainians who speak French. Nahaylo: OK, let me ask you now about what you actually do yourself. You’re running, not for the first time, a TV programme where you have very interesting discussions on political topics of the day. How did you get involved in that and why? Why do you feel that this is important to this here Ukraine? Védrine: In English. At first I had a TV programme UA Tea Time on the First National TV of Ukraine, I presented with my colleague Sergey Velichanskiy. After that I was on UA TV, and now I am on Obozrevatel TV. Nahaylo: What’s your program called? Vedrine: Western Voice with Olivier Vedrine, and the aim is to show Ukraine to Western Europe and to show Western Europe to Ukraine, like a bridge, you know? We speak about international policy, more focused on Ukraine, and more focused on Russia also, because the crisis is with Russia and the war is with Russia. And that’s why each week I invite two guests, one by skype and one in the studio, one living in Ukraine and the other from abroad and we change. Nahaylo: That’s a very interesting approach. I was also struck by the fact that you were recently cited in a piece in Le Monde which was dealing with a very interesting topic: Russian political refugees – exiles, if you want, now that find themselves in Kyiv, and the conditions that they’re in, and the fact that they are free in challenging conditions. So has Kyiv become kind of a haven for dissidents – or how should we call them – for democrats from Russia? Nahaylo: Like Napoleon in 1812 crossing the Berezina? Vedrine: I hope not. No, this is the beginning, the first stage of a re-conquest. For me, Kyiv is a symbol. I say in this article that Kyiv is the beginning of Ukraine and the beginning of Russia. I said many times that Kyiv is the past of Ukraine and also the past of Russia, and that it will shape the future of Russia. What’s happened now in Kyiv, the acceptance of this way of thinking about democratic values, is also the future of Russia. For me it is maybe like a new London, a symbol for a resistance to an authoritarian regime. Nahaylo: Like Geneva, in 1848, for instance, when the great Russian liberal Herzen was there? Vedrine: Yes, Geneva, for example. Nahaylo: Or where I use to live – Ferney-Voltaire, where Voltaire lived as a refugee but communicated with the entire liberal elements of Europe. Vedrine: Yes, we can take that example, but really, Kyiv is very important for the Russian opposition in an exile, and to be in Kyiv. Nahaylo: And see for themselves. As we know, the official line from the Putin regime has been that everything that it did was “in defence of Russian speakers, ethnic Russians.” And yet, I think, you hear more Russian spoke in Kyiv than in many other cities around the world. Vedrine: You know, for me, I speak English, I speak French, and I speak a little in Russian also. And when I speak Russian in Ukraine, nobody hurts me, nobody tells me I’m wrong. Nahaylo: You feel comfortable here? And you are from a Russian background? Vedrine: Yes. You know, when I say my name, “Vedrine,” they say, “Okay, this is Russian.” But nobody attacks me. Nahaylo: That’s good. That shows that progress is being made. Look, we are running out of time. I always ask my guest for last minute thoughts, wishes, any messages they want to pass on to people listening. It can be about the state of affairs here, it can be an invitation for people to come here, it could just be your thoughts on the future of this country. What would you say, in a nutshell? Vedrine: I would say, as I say in the end of my TV show, and you are from Great Britain and I what I really like in Great Britain is Winston Churchill — “Never give up. Never give up.” And I want to say to the Ukrainians, never give up! Nahaylo: Thank you very much for those kind, inspiring words. Let’s hope that Ukrainians in their own way will be a part of the bulldog breed. Thank you, Olivier, for taking part in our discussion this week. 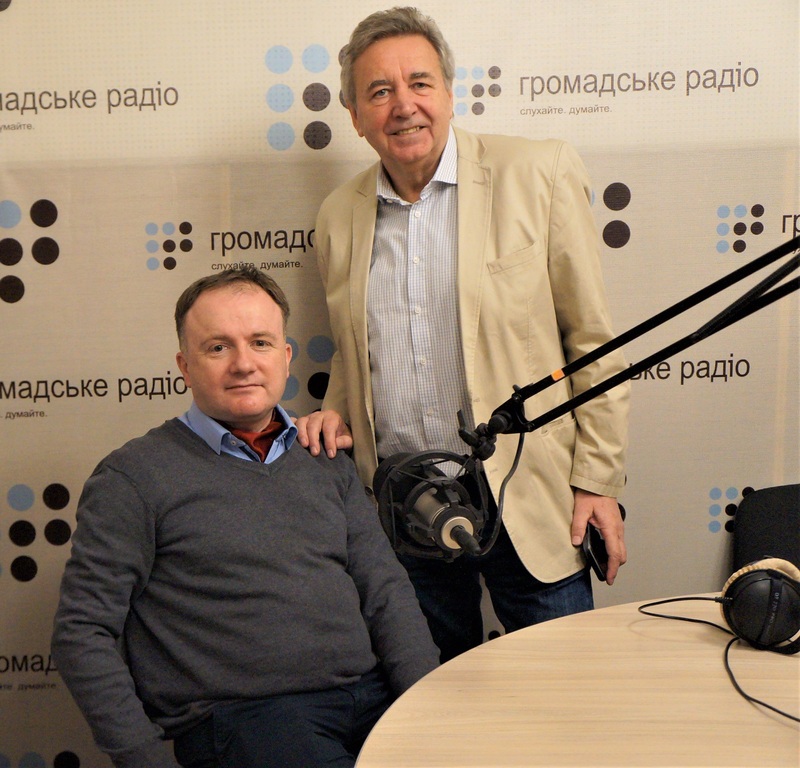 Nahaylo: Just to remind listeners that my guest this week is Olivier Vedrine, a French scholar, journalist and, as we are discovering, a good friend of Ukraine. When you start listening to this song you might wonder what the language is. It’s actually Norwegian. But then it switches to Ukrainian. The song is called Стомлена, which means Tired (but referring to a woman). The Kyiv band Idealism Addict recently released a new album, Hard Times. This song is from that album. Enjoy! Next week we’ll be back with more commentary on events in Ukraine with our interview host Marta Dyczok. We would be happy to receive any feedback from you. Write to us at: [email protected]. This is Oksana Smerechuk in Kyiv. Thanks so much for listening. Interview transcribed by Marta Dyczok, Larysa Iavorenko, Nykole King, and Caitilin O’Hare. Music by Marta Dyczok. Sound engineer Andriy Izdryk. E-mail distribution Ilona Sviezhentseva. Web support Kyrylo Loukerenko.